We are in Arahama area. Looks like there is a dog. There is a dog. He looks tired and dirty. He must have been caught in the tsunami. He looks very dirty. He has a collar. He must be someone’s pet. He has a silver collar. He is shaking. He seems very afraid. Oh, there is another dog. I wonder if he is dead. Right there. There is another dog right next to the one sitting down. He is not moving. I wonder. I wonder if he is alright. The dog is protecting him. Yes. He is protecting the dog. That is why he did not want us to approach them. He was trying to keep us at bay. I can’t watch this. This is a very difficult to watch. Oh. Look. He is moving. He is alive. I am so happy to see that he is alive. Yes! Yes! He is alive. He looks to be weakened. We need to them to be rescued soon. We really want them rescued soon. Oh good. He’s getting up. It is amazing how they survived the tremendous earthquake and tsunami. It’s just amazing that they survived through this all. It is a honorific ecclesiastical title. The Pope has honoured three former Anglican bishops, the first members of the Ordinariate of Our Lady of Walsingham, with the title of monsignor. Fr Keith Newton, the leader of the Ordinariate who has most of the functions of a bishop, and Fr John Broadhurst, the former Bishop of Fulham, have been granted the papal award of Apostolic Pronotary, the highest ecclesial title for non-bishops. Fr Andrew Burnham, the former Bishop of Ebbsfleet, has been granted the papal award of Prelate of Honour, and is therefore also a monsignor. The three men became the first clergy of the world’s first personal ordinariate set up for groups of former Anglicans as a result of the Apostolic Constitution Anglicanorum coetibus in January. Groups of former Anglicans will be received into the Church in Holy Week and the priests for the ordinariate will be ordained around Pentecost. The ordinary expects that about 900 people will become members of the ordinariate in Holy Week, including 61 members of the clergy. A majority of the laity entering the ordinariate took part in Rite of Election ceremonies across the country last weekend. 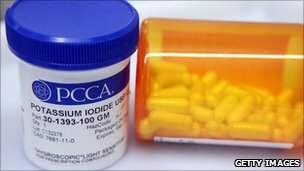 Fears of radiation sickness stemming from the unfolding nuclear crisis in Japan have prompted a surge in US sales of potassium iodide. Potassium iodide (KI), a salt, floods the thyroid gland with non-radioactive iodine which lessens the amount of radiation the gland can absorb. Pharmacies do not generally carry KI, but several manufacturers have reported being out of stock. “This is insanity,” Ms Fleming Wurdack said. The company received more than 350 calls with orders from clients ranging from housewives to state governments on Tuesday, she said. It also received orders from companies intending to send KI to their employees in Japan. Ms Fleming Wurdack told the BBC that her company had ordered additional raw materials to manufacture more KI solution. The Wall Street Journal also has the news. Earthquake forcaster Jim Berkland warns of a ‘high risk’ seismic window and potential for a massive quake poised to strike somewhere in North America in between the dates of March 19th and 26th. Scary… But I really hope he’s wrong! Christ shield me this day: Christ with me, Christ before me, Christ behind me, Christ in me, Christ beneath me, Christ above me, Christ on my right, Christ on my left, Christ when I lie down, Christ when I arise, Christ in the heart of every person who thinks of me, Christ in the eye that sees me, Christ in the ear that hears me (The Breastplate of St Patrick). Patrick is famous for using the shamrock, a flower native to Ireland to explain the Trinity to the pagans who did not understand. Just as the shamrock has three leaves but is one flower, so the trinity has three persons but is one God, he said.